This is one of the few RAF Squadron Badges that were approved and signed by Edward VIII. It is dated May 1936. It is a 'Winged Lion Statant'. The Latin motto may be translated as Always Prepared. The Tudor Crown shown here was used before the Accession of HM The Queen in 1952, after which it was changed to the Edward Crown. The Squadron Standard, presented by HM The Queen in 1956, was the first to be presented by the Reigning Sovereign in person. That was laid up in Leicester Cathedral on the disbandment of the Squadron in 1984. In 2002 No.2 Flying Training Squadron at 1 FTS, RAF Linton on Ouse was renumbered as No.207 (Reserve) Squadron. A new and revised Standard was presented to the Squadron at Linton by HRH Prince Andrew on 25th November 2003. 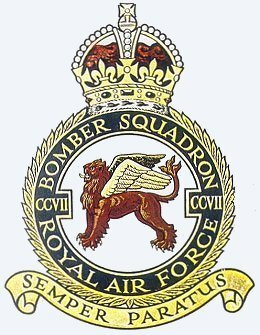 In 2012 the Squadron was merged into No.72 (R) Squadron at Linton. 207(R)'s Disbandment Parade took place on 13th January 2012. Its Standard was laid up in Lincoln Cathedral on Thursday 3rd October 2013. On 5th July 2017 it was announced that the Squadron which will train future Royal Air Force and Royal Navy F-35B Lightning pilots at RAF Marham will be No.207 Squadron. The Lightning OCU stands up as No.207 Squadron on 1 July 2019. Following the closure of the Squadron Association wef 31 Oct 2013, this huge website was relaunched as the 207 Squadron Royal Air Force History website on 31 December 2013. It continues to be updated and expanded. Please contact the editor with suggested corrections or additions.